Its not about being perfect. Its about effort and when you bring that effort and when you bring that effort every single day that is when transformation happens. That's how changes occur. Try hard not just to win tennis but to improve yourself. "Are you Game" ?? Be a part of a sensational tennis event and give yourself a chance to improve a bit by competing against best in the business. 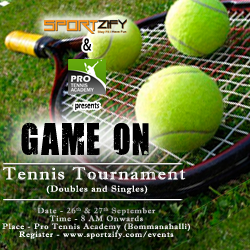 Sportzify along with Pro Tennis Academy bring to you an amazing tennis tournament - #GameOn . Cash prizes to be won along with goodies. Lunch is included in all the category. Contact us at 7483053630 or 8884440907 to know more details. Please contact hello@sportzify.com for the address.